I enjoy crime noir and particularly the simplicity of the hardboiled style. Most of these stories tend to be set in America and have a certain style because of it. I was intrigued to find out what a British take on hardboiled would be like. Being edited by Paul D. Brazill the the icing on the cake. I’ve always enjoyed his stories in various anthologies and so knew that I’d like at least one story in this book.This book contains forty five short stories. Money from the sale of this book goes to two charities. One that supports children and the other helps the victims of crime. So it costs less than a frothy coffee and some of that money goes to charity. There is a wide range of stories in this book. My personal favourite was by Danny Hogan. It had an unusual view point in that there were no lifetime criminals or council estate hoodies in the story at all. A middle class and middle aged man allows his festering hatred for all that is different to boil over with violent consequences. The scary thing about this story is that it fits in perfectly with the current political climate and the rise of the right. The rest of the stories cover a broad cross-section of the country and the types of people and situations that most people can relate to on some level. There are drugs, prostitution, abuse, crime and another of my favourite stories involved the senseless escalation of violence from a pair of children having a typical spat to their parents trying to kill each other. There really are a lot of different things going on in this book and it is a really interesting insight in to the less pleasant side of British crime. Not everything dodgy in this country happens in small villages. This anthology of short stories is like a vicious slap across the face when you're cornered in a dead end alley. Various writers take the reader on a dark journey into rain soaked streets where menace and death are lurking around every corner. There's sadness and humour within these stories but very little redemption. I found this a great read in short bursts, returning to it between longer novels so that the stories stayed fresh. To summarise the perfect choice for short sharp shocks but be prepared for some bleak evenings where hope has no harbour. This is a charity compilation so well done to the authors for giving their work to a worthy cause. Grit and brawn, tawdry and sheik, and utterly delicious delectable tales of desperado dames and dudes, in the throes of it!Sooooo freakin' good!" Paul D. Brazill Luca Veste Matt Hilton Allan Guthrie Tony Black Nick Quantrill Charlie Williams Ray Banks - Paul D. Brazill is the author of A Case Of Noir, Guns Of Brixton & Roman Dalton- Werewolf PI. He was born in England and lives in Poland. He is an International Thriller Writers Inc member whose writing has been translated into Italian, Polish and Slovene. He has had writing published in various magazines and anthologies, including The Mammoth Books of Best British Crime 8,10 and 11, alongside the likes of Ian Rankin, Neil Gaiman and Lee Child. 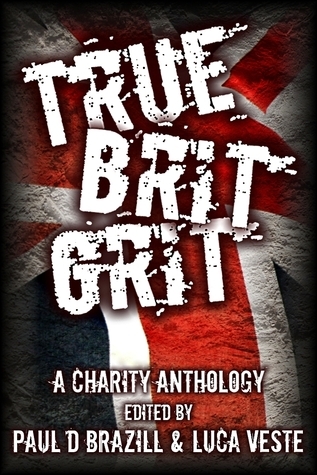 He edited the best- selling anthology True Brit Grit – with Luca Veste.